I have this bike that was painted at some point and am trying to figure out if it's a Gitane. It has a Gitane head badge and there appear to be holes in the frame that line up with the holes in the badge. The lugs on this bike don't match anything I've found in the identify sticky. The rear dropouts are Suntour GT. It has a Maxy crank with "gitane" on the arms. I can post more pics if needed. Can anyone assist with identifying this bike? Yes: It's a Japanese-built Gitane (badged) imported by Gitane Pacific. It's a Japanese made bike, probably a 1977 Olympic Record II model. Gitane Pacific was the US importer from 1974 until they went broke in 1977 (the result of a poor business model plus a changing market place that they didn't have a clue about). 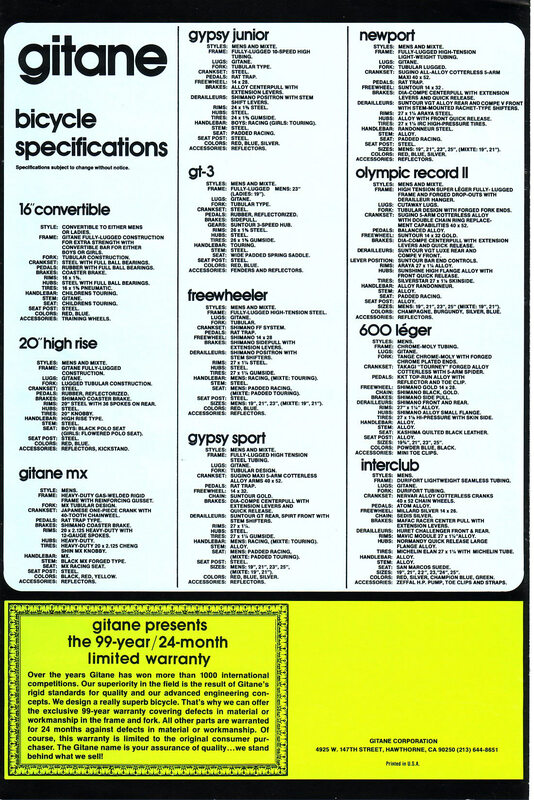 In 1975 they started importing Japanese and Taiwanese made bikes labeled Gitanes. They were aimed at the entry level market. The Olympic Record II was slightly above that level. The problem was, the Japanese and Taiwanese bike manufacturer's didn't have a domestic market for light weight derailleur equipped bikes! They built bikes to the loose specs called out by US importers, few if any of them had experience riding European sporting bikes!!! They were out to sell low priced bikes to a market that collapsed at the end of the US Bike Boom in mid 1974!!! Most of those bikes had 2 short comings: They were heavy because the frames were made with thick walled tubing which gave a "dead" feeling ride and secondly they usually handled like crap! 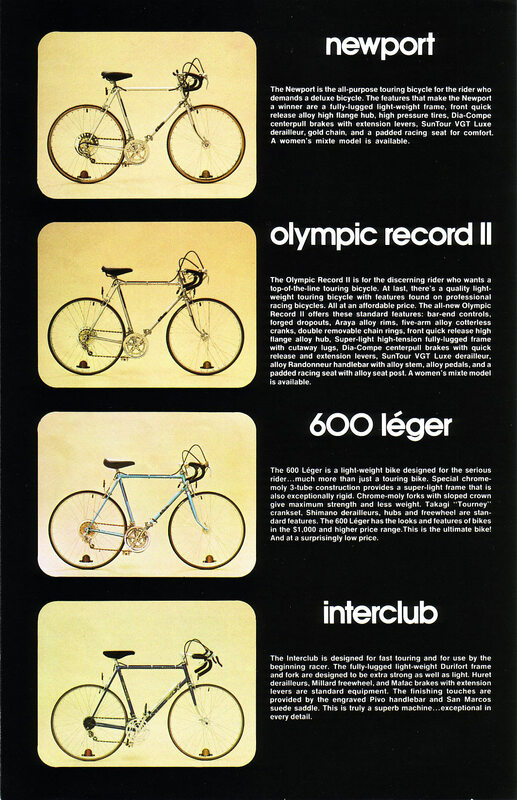 For example, the average European entry level bike from the early 1970's like a Gitane Gran Sport with all steel components weighed about 27 pounds. The Olympic Sport II probably weighed about 32 pounds with all alloy components! The Taiwan made Gypsy Sport model weighed a whopping 42 pounds for a 54cm (21") bike! The heaviest Schwinn bikes back then only weighed about 40 pounds in a 22" or 23" size! In 1975-76 we brought in a few of the Asian made "Gitanes" to check them out. Compared to comparable European bikes, they rode so poorly that we ended up selling them at our cost or even less just to get rid of them! We kept one of the 42 pound Gypsy Sport bikes around for customer to comparison ride. It sold a lot of bikes for us! By the late 1970's some Americans with a lot of knowledge got involved and showed the Japanese how to build bikes that competed with the better quality European bikes. As the economic market changed (Yen to Dollar ratio) manufacturing shifted to Taiwan for many of these bikes. So now that I've burst your bubble.... "Rubber wheels beat rubber heels"
With an overhaul and tuneup plus new cables, cable housings, brake pads, tires and tubes, you'll have a bike to enjoy riding around. A bike shop can do those maintenance things which can set you back up to $150 or ~$40-$80 if you do the work yourself. I wouldn't invest too much time or money in this bike. If you haven't ridden much or experienced a classic light weight bike then you're in for a pleasant surprise! You can pick up a nice classic lightweight steel bike for $300 to $600. One other thing, make sure that the bike fits - the frame isn't too big or too small for you to comfortably ride. You should have 1" to 2" of standover height in case you have to dismount in a hurry. One LAST thing that I forgot to mention, it always helps to post a picture of the complete bike from the "drive side" (right side) showing the cranks and derailleurs as well as the closeups you did. Man, Chas. YOu are the best! Thanks for the detailed info guys. Here's the full bike from the drive side. The derailleurs match the ORII specs, so I bet you're spot on with that ID. It's interesting that the bar end shifters were probably original to this bike, I figured a PO added them. I may end up borrowing those and the rando bars for another project. This bike isn't far from being functional and I should have it back on the road soon.